I will make another card for next weeks challenge. I love playing with the bees. Julee posted a great sketch a while ago that I just had to try out. I varied from her sketch only that I made it into a special fold. You take this lovely May Arts ribbon off, pull on the left side and it opens up to a card 4 1/4″ x 11″. I used Prima Cardstock, Scenic Route and Daisy D’s patterned paper. I stamped the Stampendous Pal Topper on shimmery white cardstock, cut it out and layered it on Ruby red cardstock I had sponged with chocolate chip first. I stamped sweet friend all around the yellow paper with Karen Foster Snap stamps. Then I added don’t worry on the top right with the bigger version of those stamps. The flowers the bees are holding is a Prima flower. The flowers on the bottom left are punch outs from the Spring Flower punch. I punched them out in Ruby Red and sponged the petals with chocolate chip. The center is a mustard brad. I love Stampin’ Up! colored brads. On the main image are usually black dots. I covered those up with Amuse Twinkle Stickers. To finish it off I highlighted the darker colored parts of the bees with the Stardust glitter pen. This is a super cute layout! Love the bees and the way you colored them! Love the bling and all the other special touches you’ve given this. such a cute card! I love the jewel stickers and the prima. Everything looks great, good job! This is absolutely adorable! Gotta get some of those bee stamps! Love the colors, the layout, and especially all the bling! That is TOO funny! I used my Ladybug Topper for that same sketch! hahahaha Great minds! 🙂 LOVE your card! HeHe. 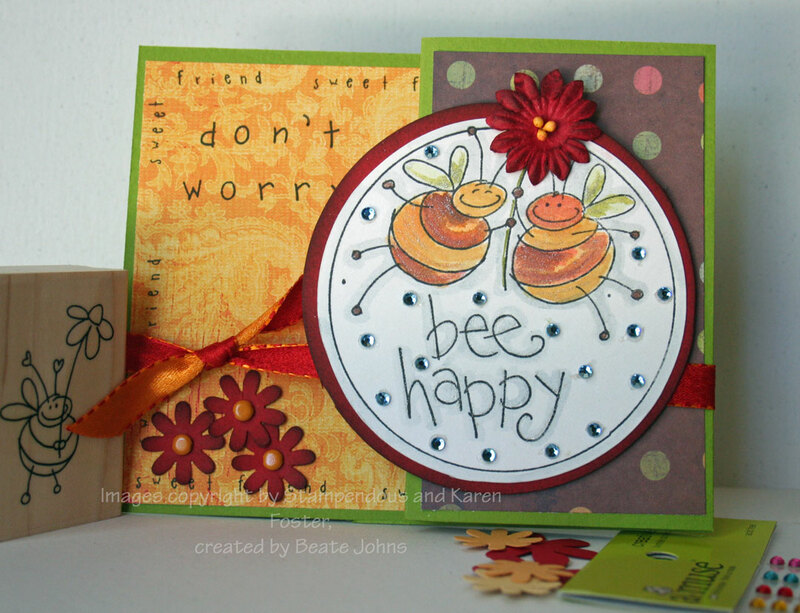 Love the “Don’t worry” you added to the “Bee Happpy” sentiment. Great idea to use Julee’s sketch with this card opening, too. Too adorable. I love the ribbon closure with the flowers and the bees and your coloring and…everything! I just found this stamp at my LSS and was so excited! I love what you did with the flower…what a great idea! I also love the “don’t worry” part! I absolutely love to visit your blog! This card is AWESOME! I love the colors and the layout. I love this! The colours are fab and the layout is reeally cool. I’m going to have to try this!! This is so incredibly cute!!!!!!!!!!!!!!!!!!!!!! The card is adorable but just how am I supposed to go to sleep with that silly song stuck in my head? Don’t worry… be happy now. Wow beate …… it’s adorable!!!! 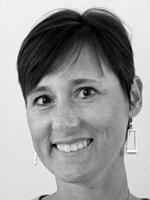 Hi Beate! I am just LUVING the colors your are using!!! They are so deep n’ rich, and just something so purdy!!!! Oh my…. thanks for your help in allowing me to add another favorite color combo on my list. Oh, how cute is this? The colors, the sketch just everything about it screams adorable. I’ve got my fingers in my ears lalalalalalalalalalala, I’m not going to buy these stamps, lol. This is fabulous, Beate. I love the fold and those twinkle Amuse stickers. Methinks I’ll be searching for those next time I’m at the LSS. STINGINGLY CUTE. You did a fabulous job with the paper, colors, Stickles, coloring, and Snap Stamps. TFS. Too cute! Love the colors and the fold is great!! !